I find it interesting that Dana Brooke and Emma have been apart of two recent NXT Women’s Division debuts recently. I wonder if they (Emma in particular) are seen as gatekeepers, or it is just coincidence. As for the match, Emma did a great job being a bully, and the “Evil Emma” character suits her very well. The way she tossed around Shazza without a care was great, and she just comes off as pretty unlikeable. Shazza sold well, but that’s about all she did. It was essentially just a squash so Emma and Brooke can have some momentum after fighting Asuka. I will give this match bonus points, however, for Emma working over the hair, which is something I have never seen before. Other than that, though, this match is entirely forgettable. The commentators, Rich Brennan, Corey Graves, and Byron Saxon, kind of introduce themselves and recap James Storm’s NXT debut. Seeing James Storm in WWE is one of the most surreal things I have seen in wrestling. James Storm’s interview after his first NXT match is shown, and he seems legitimately excited, and cuts a great promo establishing his personality. This was as good as a TV tag team match gets. It was the old cliché formula done a thousand times, but it was done especially well here. All these four added something to this match, and are vital to how it played out. Gable got beaten down during the heat and got the crowd so invested in the match. Gargano pulled incredibly crisp spots and sequences with both Jordan and Gable, which made the match that much better. Ciampa played sort of a bruiser, and used some beefy shots to stand out from the crowd. Jordan made the comeback and ran wild with lots of fire and intensity. Everything, from the opening knuckle lock sequence, to Gargano’s incredibly fun spots, to the heat segment was done well. The only thing missing that keeps this from going any higher is the lack of a real dramatic finishing sequence to put a bow on the match. This is still worth watching, however, and everyone should go out of their way to see this. This was a nothing match that had no impact on me. I mean, Nia dominated, Kay Lee got a surprising amount of offense, and then the match ended. Kay Lee was far and away the better wrestler, though, and it seems Nia is still very green. She never did anything remotely advanced, and was never all that good, while Ray did her best to bump around Jax and try to do something. Jax kinda just stood around for a bit while Ray did stuff, which is not a comforting sign. Also, Jax’s finisher looks awful. Overall nothing match, where Nia Jax does the exact opposite of impress. Dash & Dawson attack Amore & Cassidy pre-bell, and assault Cassidy’s leg. Referees and doctors check on Cassidy. Dash & Dawson mock Cassidy as they exit the arena. This was a decent enough segment to advance the feud, and I have no qualms with it. As the bell never rung and the match never occurred, I cannot rate it, even though it was good. Alexa Bliss is backstage with Blake & Murphy, and Bliss challenges Bayley to a six man tag match with her, Blake, & Murphy. Her guys, however, just giggle like complete goons in the background. Next week’s main event is again hyped, and Apollo Crews’ journey is recapped in a similar way to Finn earlier. Crews is just the most charming guy, and he could seriously be a main eventer in WWE in the future. He has the charisma, the mic skills, the look, and the in ring. Give him the world. Finally, its time for the MAIN EVENT! This was an overall a good match, and the perfect main event to a very solid. Breeze was a very good cowardly heel, and tried to avoid Joe’s devastating offense early, but Joe’s elbow suicida turned the tables. Other than that, this match was the basic heat, comeback, finish match executed very well. Since Joe is one of the best of the 21st century and Breeze is a very solid hand, it was nearly impossible for this match to be poorly executed. The action was all solid with no botches, the heat had constant action, Breeze only resorted to one very brief rest hold, and the finishing sequence was fun as hell. As this may be Tyler’s final match in NXT before going to the main roster full-time, this was a good sendoff and a good goodbye. While this was a pretty standard match in its structure, the execution made it very fun, and a breeze (pun intended) to watch. Backstage, Finn Bálor is interviewed and hypes his match with Crews next week. He says he respects Apollo, but he will win. Close curtain. This show was a hell of a lot of fun! 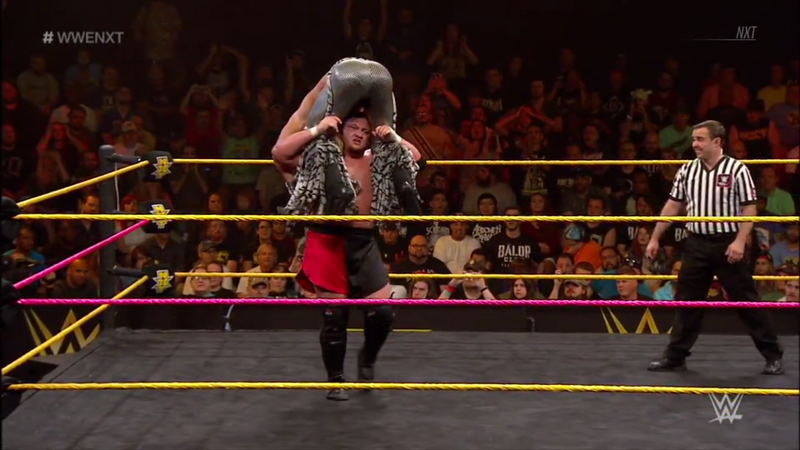 NXT this week built well to next week, forwarded all the current feuds, and gave enough quality wrestling to satisfy. The tag match was clearly the MOTN, but the main event wasn’t too far behind. Overall, this was a solid hour of wrestling that is surely worth a watch. That was the NXT Episode 304 review. This was a fun show, so if you have the WWE Network, watch it now. As for this site, I want to review Hell in a Cell under a week after it occurred, so I will watch it today, and into Saturday. After that, I will return to PWG and try to watch BOLA Stage 2 if my schedule allows it. Once I return from my excursion to PWG, I will return to NWA & WCW for the Starrcade 1990 review. A RMR may come out soon as well. Other than that, my contacts are here or at the sidebar to the left, and I do writing for Free Pro Wrestling if you want to check it out. My first review is here, and I plan to do many more in the future. Other than that, thank you for reading, and I hope to see you next time!